The goal line is the section of the end line within the key. Each end of the goal line is marked with a cone-shaped pylon. Players score by carrying the ball across the goal line. 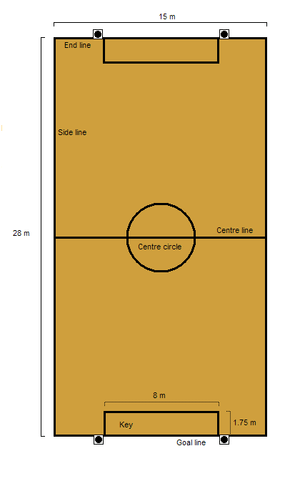 For a goal to count, two wheels of the player’s wheelchair must cross the line while the player has possession of the ball. A team is not allowed to have more than three players in their own key while they are defending their goal line. Offensive players are not permitted to remain in the opposing team’s key for more than ten seconds. Fouls are penalized by either a one-minute penalty, for defensive fouls and technical fouls, or a loss of possession, for offensive fouls. In some cases, a penalty goal may be awarded in lieu of a penalty. Common fouls include spinning (striking an opponent’s wheelchair behind the main axle, causing it to spin horizontally or vertically), illegal use of hands or reaching in (striking an opponent with the arms or hands), and holding (holding or obstructing an opponent by grasping with the hands or arms, or falling onto them).